Roasting the peppers adds another level of flavour and complexity to the dish. This dip isn’t fussy, or at least it really shouldn’t be. In fact, it should be prepared in exactly the same way it is intended to be eaten – that is, in a leisurely fashion. Take your time roasting and chopping and mixing it all together and then promptly enjoy eating it, standing barefoot in your yard, feeling the grass tickle your toes beneath you. Roasting your own peppers is a must because not only do they taste fantastic and are much better than any jarred version, but it is so easy to do. Charring anything, in my opinion, is one of the simplest ways to transform an ingredient – it adds a whole other level of flavour and complexity to anything you use it in after. If you have never roasted your own peppers, summer is the best time of year to get started. As they come into season, this only makes them more delicious (and less expensive). This recipe is designed to be prepared in one go, but the peppers can be roasted and marinated a day or two in advance. The more time they sit in the marinade, the more they will soak up the flavour from the vinegar and the chili flakes. 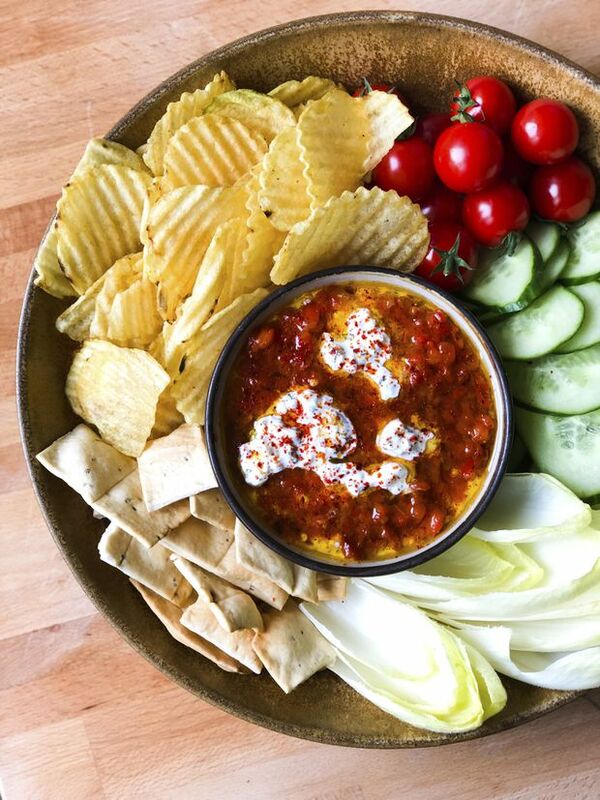 Dips are perfect for summer as they are easily packable for picnics or potlucks. They are as adaptable as they are scoopable and can be eaten heaped on just about anything flat and savoury. I personally love cucumber slices and plain ridge chips. This dip is best if eaten within a day, but can be made up to four days in advance if necessary. Simply adjust the seasoning if needed. Prepare it in advance and pull it from the fridge when you need it, such as on a less leisurely afternoon perhaps, when you don’t have time to do any cooking but still want to feel the sun kiss your shoulders, even if just for a moment. Heat the oven on broil to 390 F or simply use the high setting if your oven doesn’t have the option to choose the temperature when broiling. Line a baking sheet with aluminum foil and place the peppers on the tray. Place the tray in the oven on the rack that allows the peppers to be closest to the broiler without touching. Cook for 30 minutes, rotating the peppers every 10 minutes to ensure even colouring. The peppers should be roasted and blackened all over. Carefully remove the peppers from the oven. Transfer them to a bowl and cover them with a plate or a lid and allow to sit and steam for 10 minutes. Peel the blackened skin from each of the peppers. Remove any stems and seeds and discard. Dice the peppers and then continue to chop until a chunky paste is achieved. Place in a bowl and add the olive oil, red wine vinegar, fleur de sel, chili flakes and black pepper. Stir to combine. To make the yogurt, combine all ingredients in a bowl and gently fold together until just combined. Layer a serving bowl with the feta and mint yogurt and the marinated roasted red peppers. Drizzle with a healthy dose of extra virgin olive oil and sprinkle with chili flakes as garnish. Serve with crackers, or chips, or cucumber slices or anything else flat and scoopable. How do I make the perfect summer salad?